No quantitative test exists to reliably assess kneeling tolerance before and after surgery. The aim of this study was to validate a kneeling test, designed to quantify kneeling tolerance. 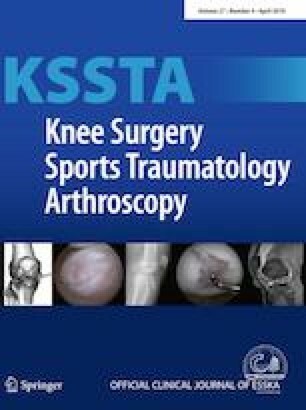 A total of 179 participants (324 knees) were enrolled into the study, including 124 asymptomatic knees, 98 with osteoarthritis (OA), 85 following total knee arthroplasty (TKA) and 17 following anterior cruciate ligament reconstruction (ACLR). Patients were asked to kneel on a custom-built platform on a soft, firm and hard surface, at both 90° and 110° of knee flexion. A kneeling score of 0–100 was established for 90° and 110° with 100 being a complete absence of pain or discomfort. A linear mixed model with random intercept was used to estimate differences between conditions (healthy, OA, ACLR and TKA). Pearson’s correlation coefficient was used to test the strength of the association between the kneeling test and the forgotten joint score (FJS) and Western Ontario and McMaster Universities Osteoarthritis Index (WOMAC) score. Test–retest reliability was estimated by the intraclass correlation coefficient (ICC). The kneeling test demonstrated good discriminative validity with differences at 110° between asymptomatic knees and knees with OA (difference = − 42, p < 0.001), following ACLR (− 12, p = 0.013) and TKA (− 26, p < 0.001). Similar differences were observed at 90°. The kneeling test demonstrated construct validity, with a moderately strong correlation observed between the kneeling test and the FJS and the WOMAC at 90° (FJS 0.474 [95%CI: 0.357, 0.577], WOMAC − 0.503 [− 0.389, − 0.602]) and 110° (FJS 0.579 [95% CI: 0.479, 0.665], WOMAC − 0.648 [− 0.560, − 0.722]). The ICC for the kneeling test at 90° and 110° was 0.843 (95% CI: 0.745, 0.905) and 0.926 (95% CI: 0.877, 0.956), respectively. The kneeling test is a valid technique to quantitatively determine kneeling tolerance. It can aid in the assessment and modification of current surgical techniques to improve patient outcomes. MK has received royalties from Zimmer and Springer publishing. ND, AS, LK, MC, JE, and TA declare they have no conflict of interest. All the participants gave their written consent and were recruited in agreement with the Helsinki Declaration. The study was approved by the ethics review board of Sir Charles Gairdner Hospital (ID: 2016-065), Perth Western Australia.